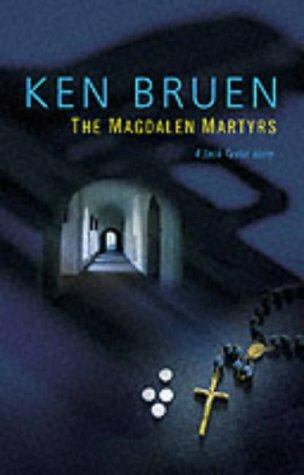 I don't read a lot of crime books, but recently was trying to shift a bunch of them out of the shop and started reading about Ken Bruen. He turns out to be a very interesting man (everyone but me probably knew this already) and highly respected among international crime writers. His books don't show up in the shop very often, so when one did, I jumped on it. The Magdalen Martyrs is not a happy book. It is crime fiction of the most hard-boiled type. In fact it's boiled, then soaked in brine for a while, then air-dried, then baked, just to ensure maximum hardness. The main character has a drink, drug and general fucked-upedness problem (he also listens to Van Morrison, which I just can't identify with), but he's funny and well-read and doesn't scare the shite out of me in the same way as, say, everyone in a James Ellroy novel would. The story is fairly simple and doesn't twist and turn like a twisty turny thing, so you can almost disregard it entirely and just immerse yourself in the seamy underbelly of, er, Galway. It's a quick read, it's fun, and I highly recommend it. If you come across Ken Bruen in an airport, definitely take him on holidays.